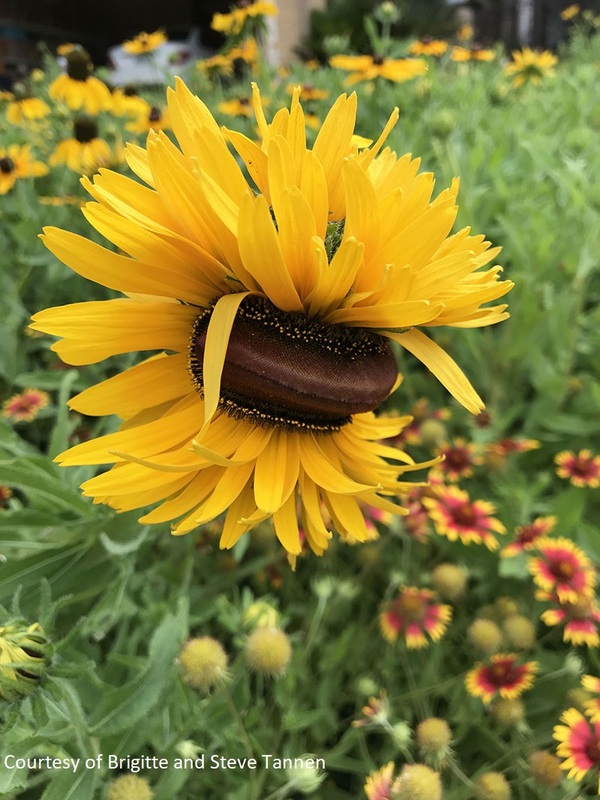 There’s one thing we can count on: nature throws us fun surprises, like these fasciated (crested) black-eyed susans in Brigitte and Steve Tannen’s garden. Fasciation is a rare abnormal plant growth, and although fascinating, isn’t harmful. 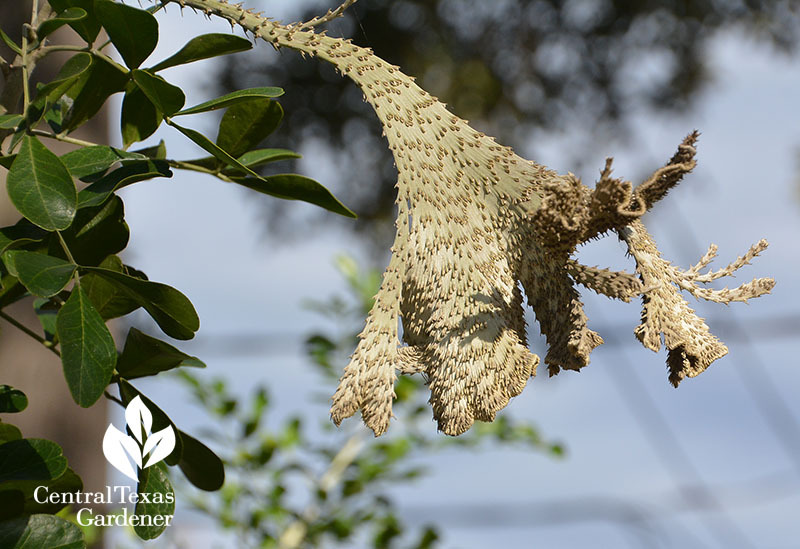 Have you ever seen this on a mountain laurel? 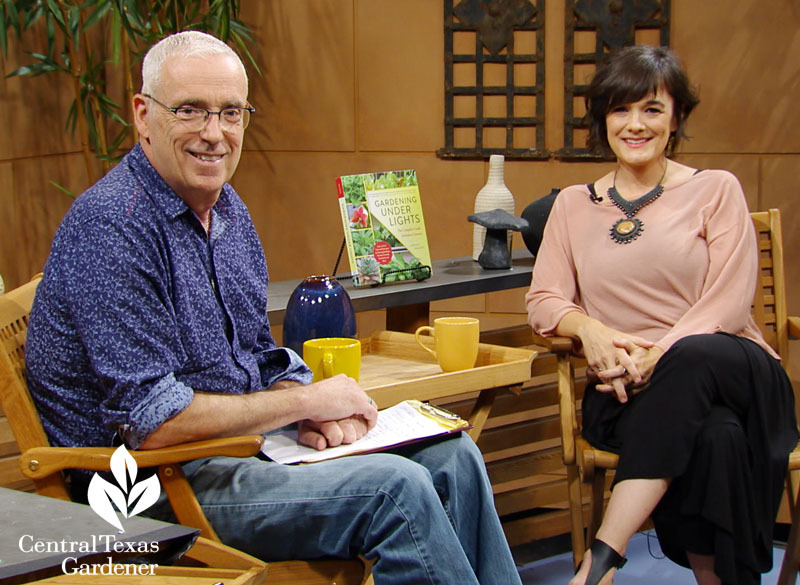 What’s not rare these days is how many CTG viewers are growing plants for wildlife, like The Giving Garden of Carollton, where bees, butterflies and birds select their food of choice. 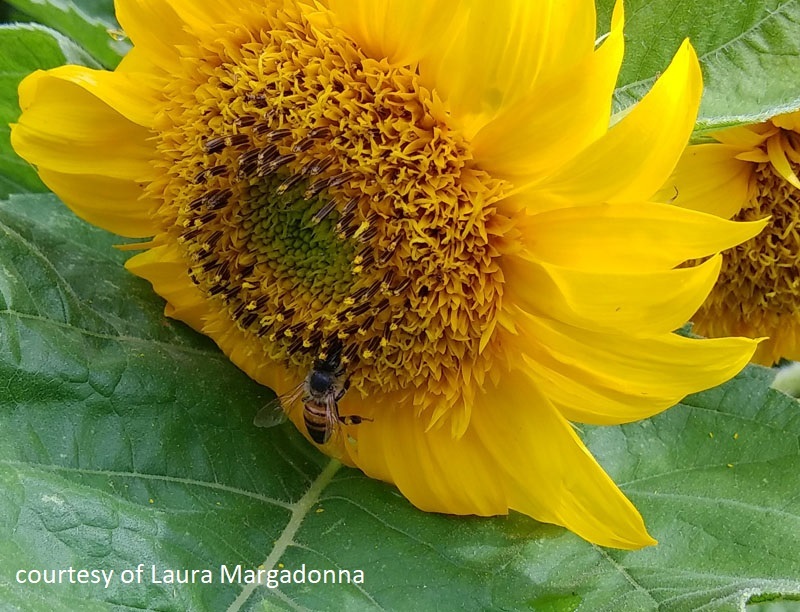 See all our viewer pollinator plants this week to get ideas of your own! 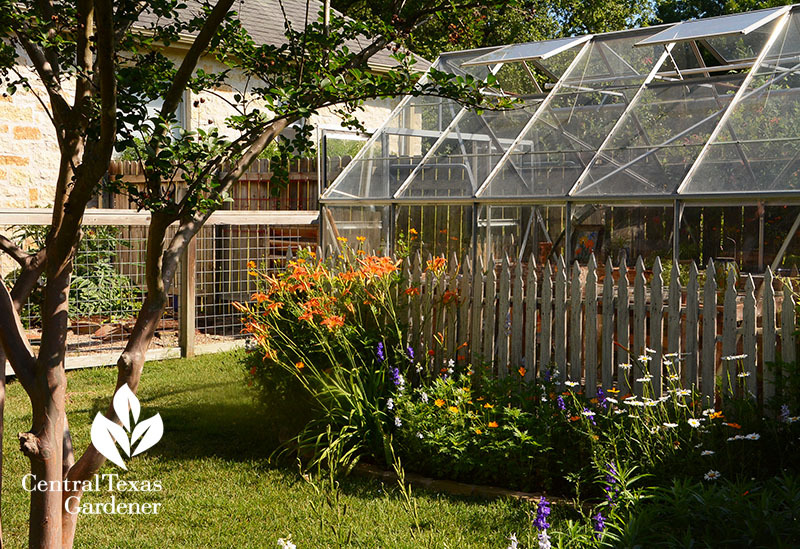 One of our first gardening lessons is how much light different plants require, a never-ending quest since sunlight patterns vary by the hour and the season. 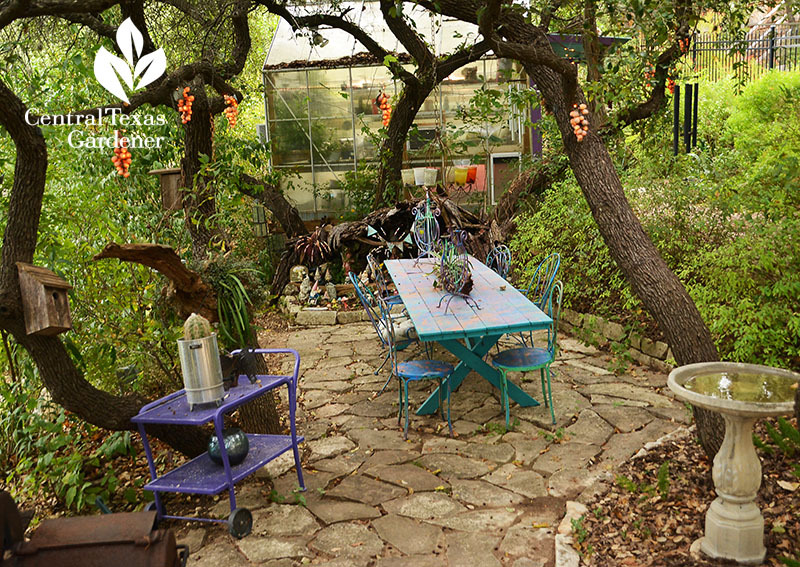 What seems bright in winter grows shady when deciduous trees leaf out. 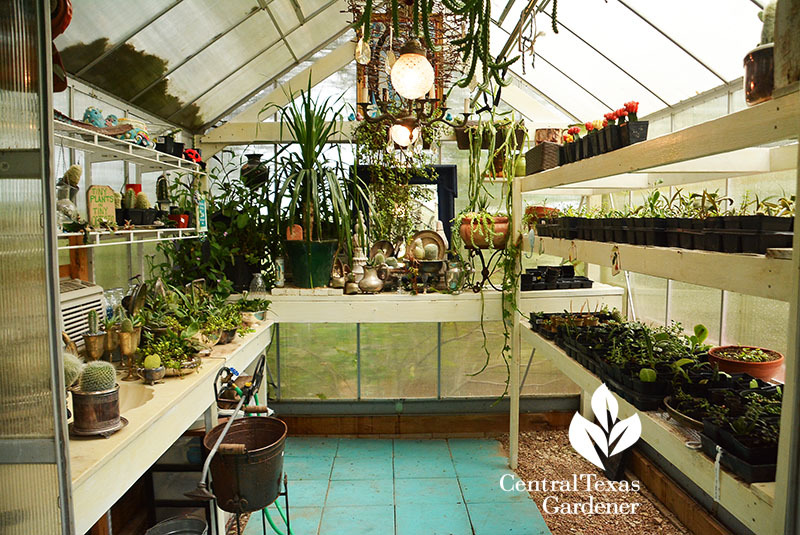 To start seeds in controlled conditions (and protect tropicals over winter), some of us grow in bright light greenhouses like designer Diana Kirby. 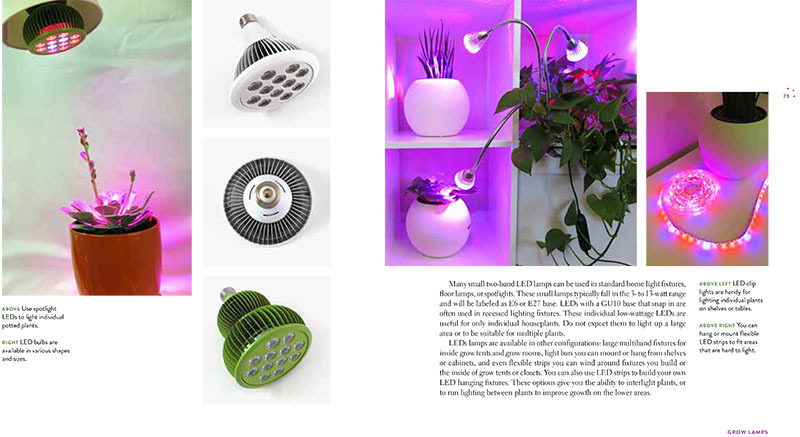 But most of us don’t have enough natural light indoors to start seeds or grow food and flowering plants without supplemental lighting. 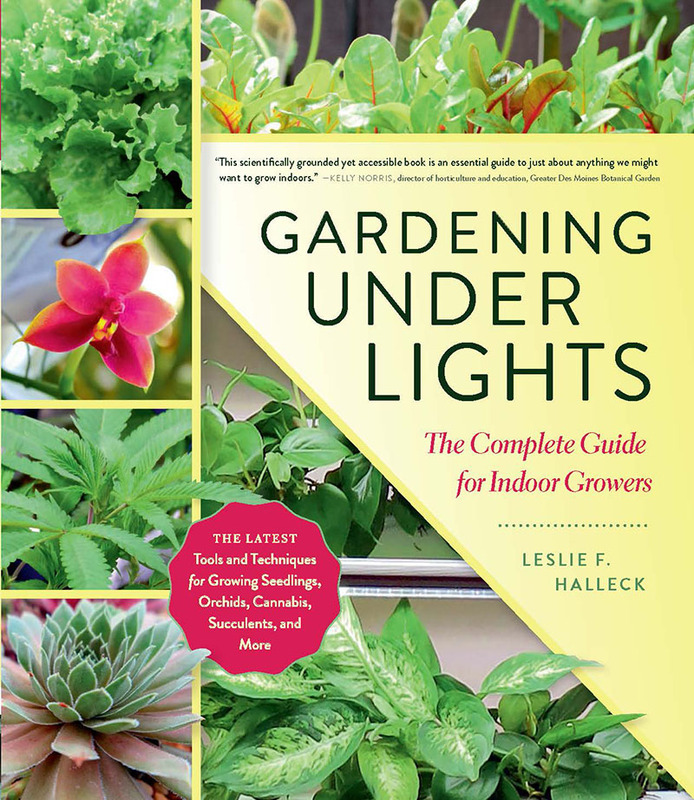 This week, Dallas-based certified professional horticulturist and green industry consultant Leslie Halleck of Halleck Horticultural illuminates how to cultivate in dim conditions with tips from her hot-off-the-press book, Gardening Under Lights: The Complete Guide for Indoor Growers. 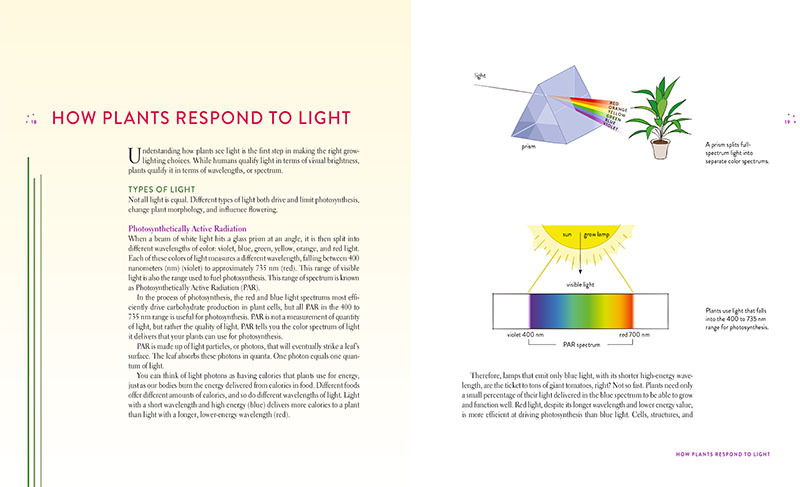 I’m so glad she throws science into the mix to illustrate how light spectrums and light intensity impact our plants (good info for outdoors, too). 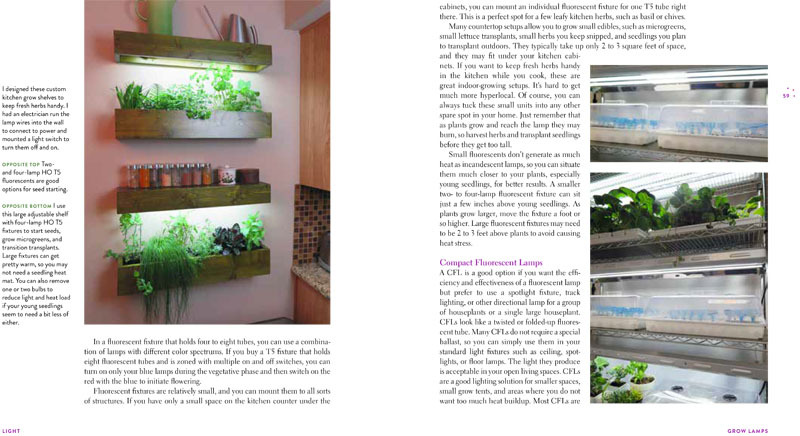 In Gardening Under Lights, Leslie steps us through design and practical details (like what type of light to pick) for growing everything under the sun (minus the sun). 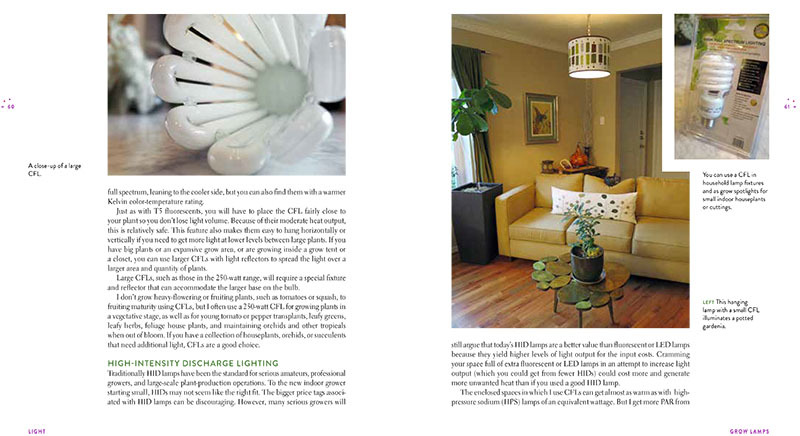 And, she puts a stylish spotlight on cold-tender plants we’d love to grow indoors if only we had enough light. Now you can! 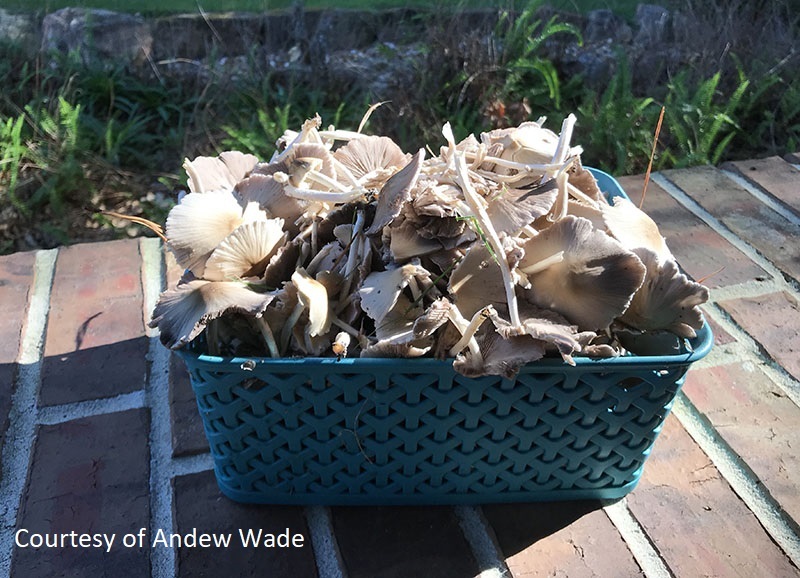 Mushrooms can be cultivated indoors, especially by mushroom farmers, but most of us find these fungi outside. 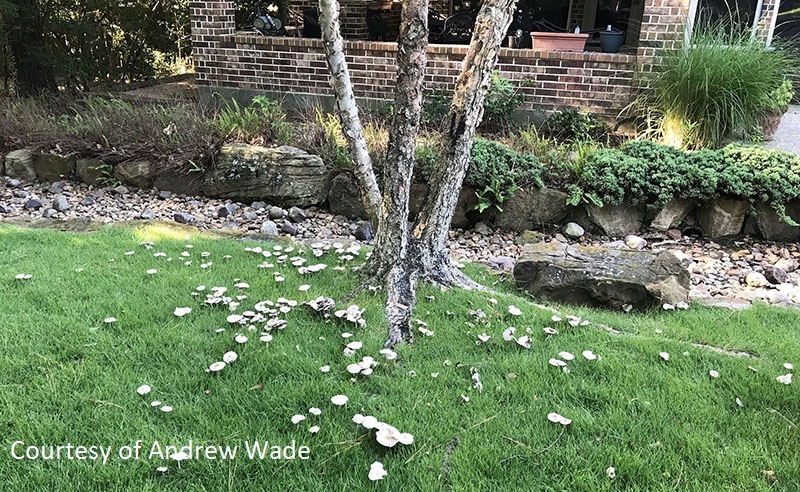 After rains a few months ago, Andrew Wade’s parents in The Woodlands hosted a bumper crop. These are a sign of healthy soil. 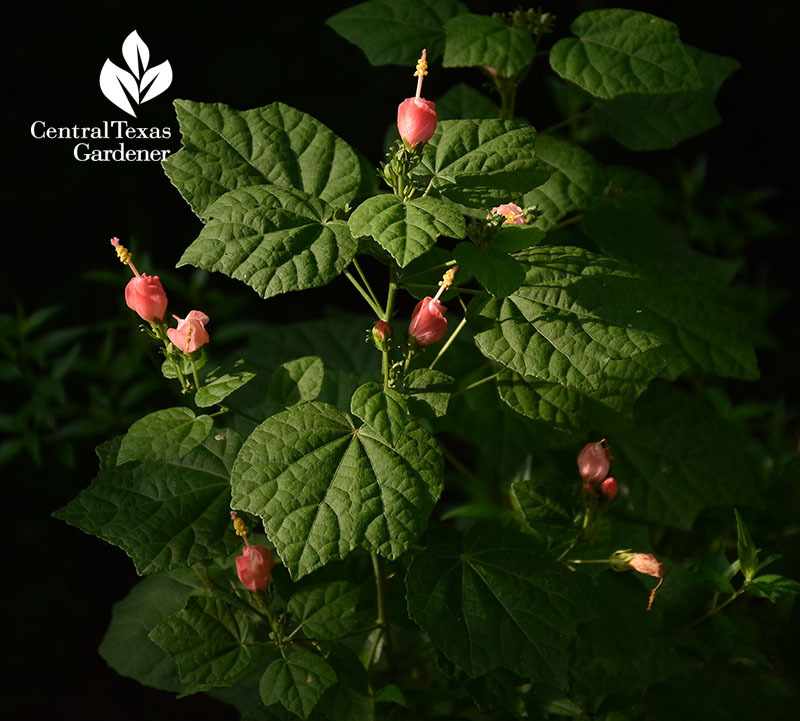 Many are not edible, so don’t even think about eating them unless you’re an expert! Just be happy that you’ve got really good mycorrhizal activity going on. Their concern is whether they’re poisonous to dogs. 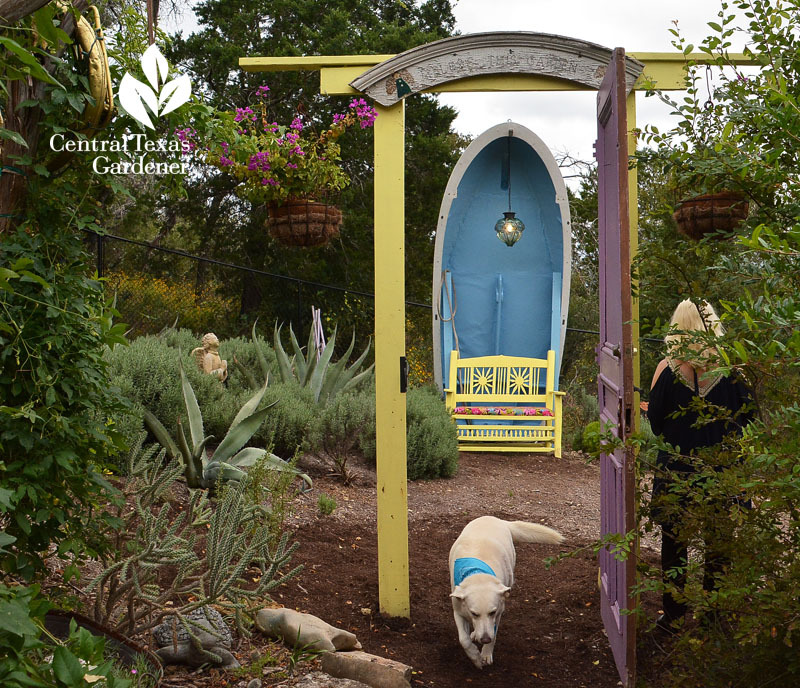 On a past CTG, we consulted Dr. T.J. Palvino at Austin Vet Hospital who said that many are poisonous to dogs, as they are for us, so do remove them if your dog’s inclined to snack on them (hide them in your compost pile). The good news is that plucking off the tops won’t destroy the soil’s network of beneficial microbes. 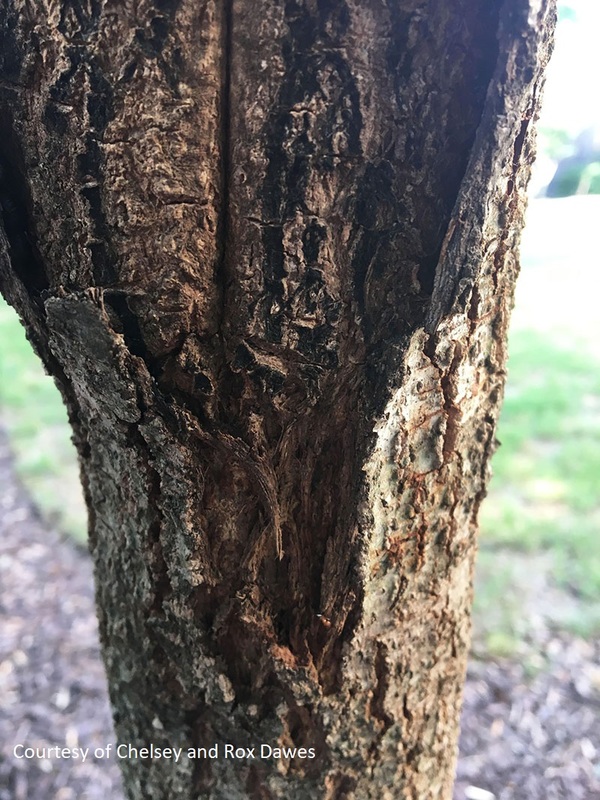 Another viewer concern, this one from Chelsey and Rox Dawes in Leander: two years ago, the trunk of their live oak tree was damaged in transport. They sealed the wound and the tree is doing fine. Except: now it’s got ants and pillbugs. They sprayed orange oil into the wound which got rid of the ants, but pillbugs took their place. Daphne checked with AgriLife Extension colleague and entomologist Wizzie Brown who told us that the ants are most likely Acrobat ants. She points out that the ants and pillbugs are just taking advantage of the situation and aren’t causing any trouble. Get Daphne’s answer on what to do now. Time for noms! 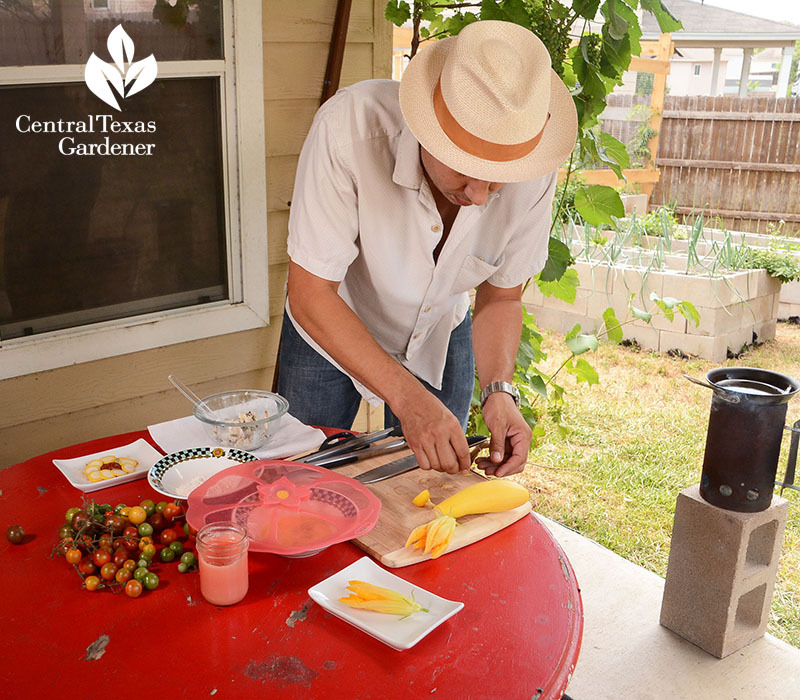 San Antonio gardeners Richard and Christine Alcorta fry up stuffed squash blossoms (Christine behind the scenes as sous chef and stager). 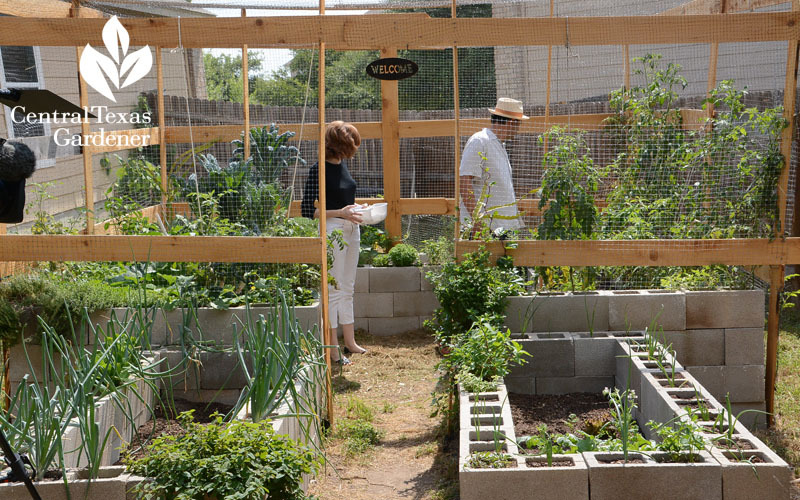 And in case you missed it, watch their cinder block design to grow crops all year on bad soil. 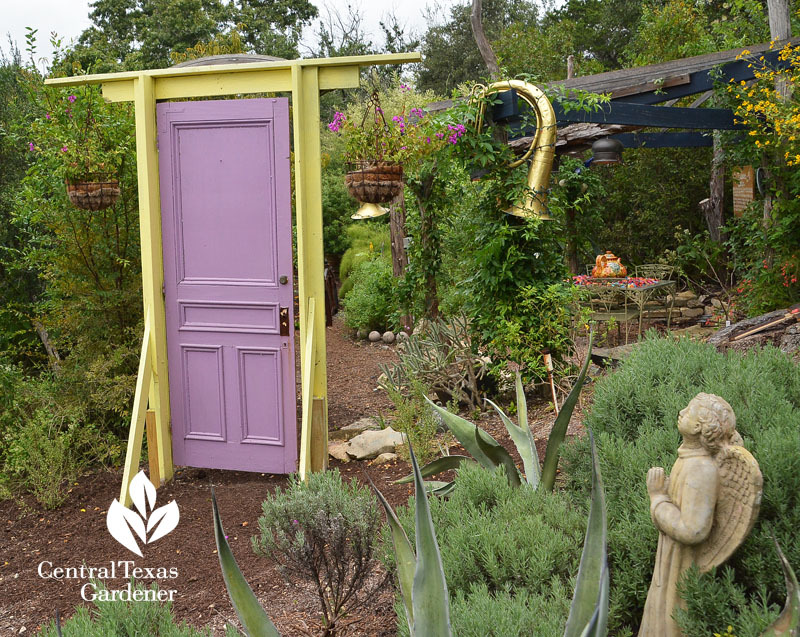 On tour, Travis County Master Gardeners Shari and John Bauer take garden design to new levels with charming, repurposed finds. 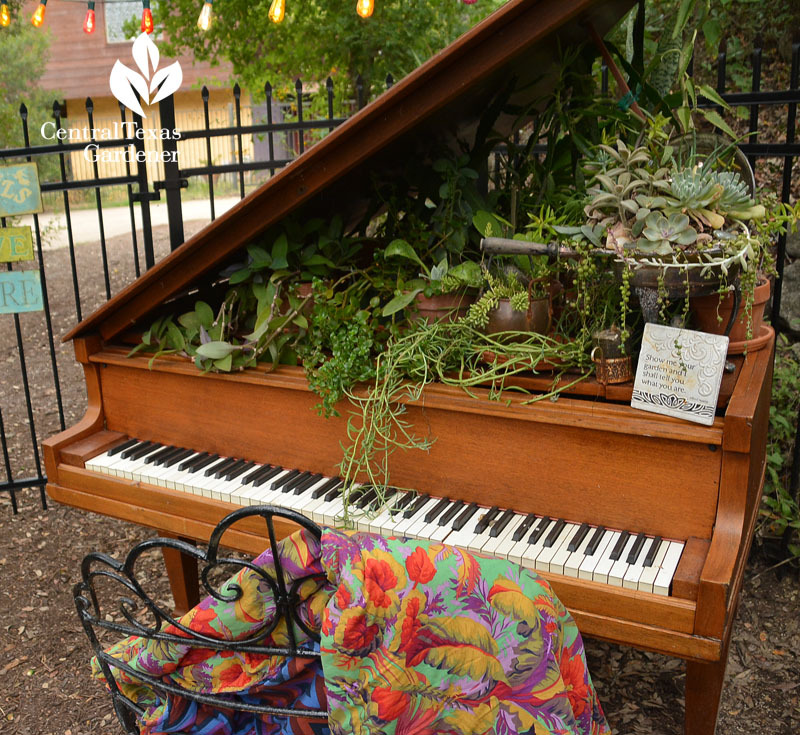 They tuck wonder into every level of their steep garden. 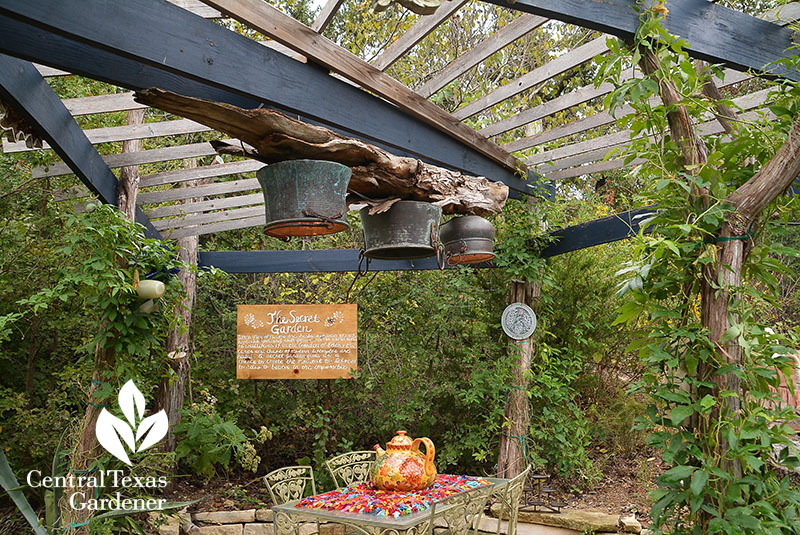 Framed with habitat plants in sun and shade, they invite wildlife to share the journey with them. 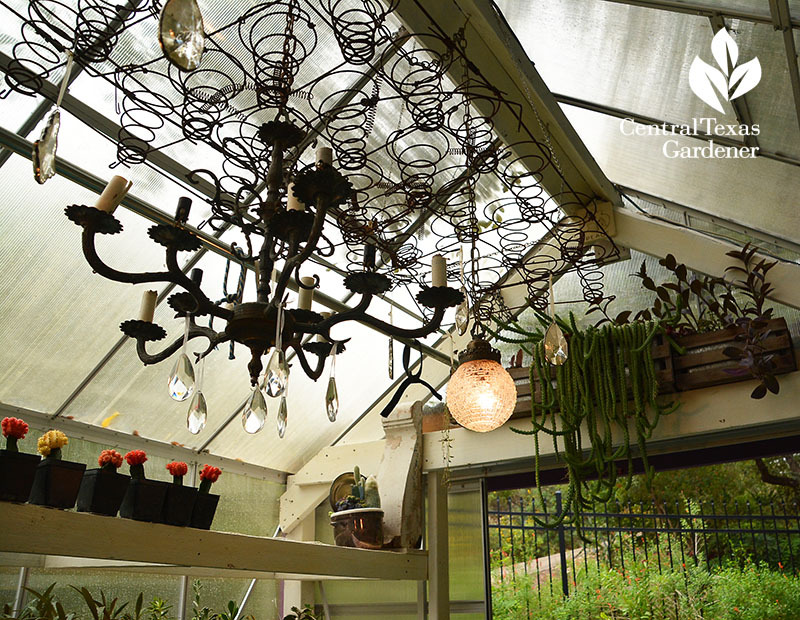 When they built Shari’s greenhouse out of scavenged materials, she gave it romance. 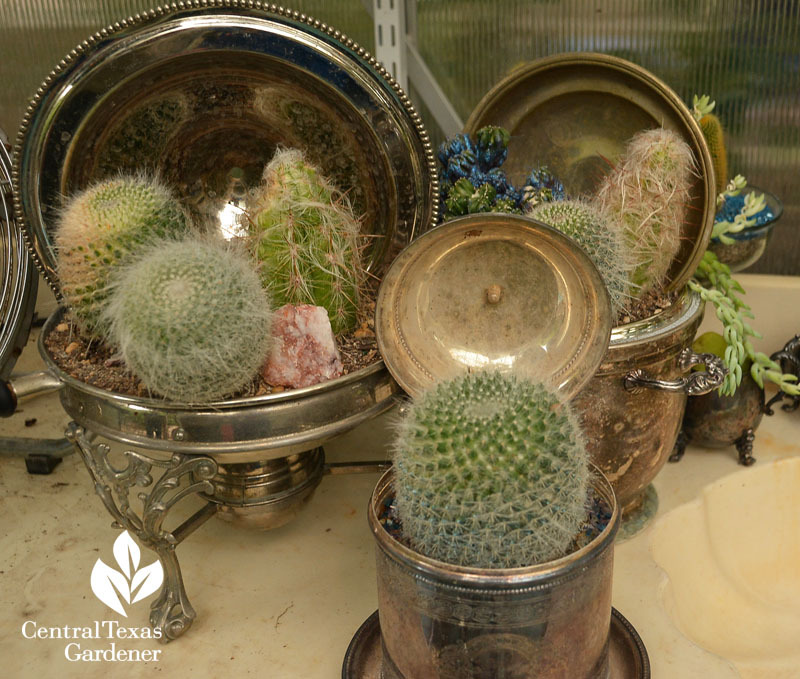 Along with hosting seedlings and divisions, she entertains gardening friends who always go home with a plant or two tucked in their arms. 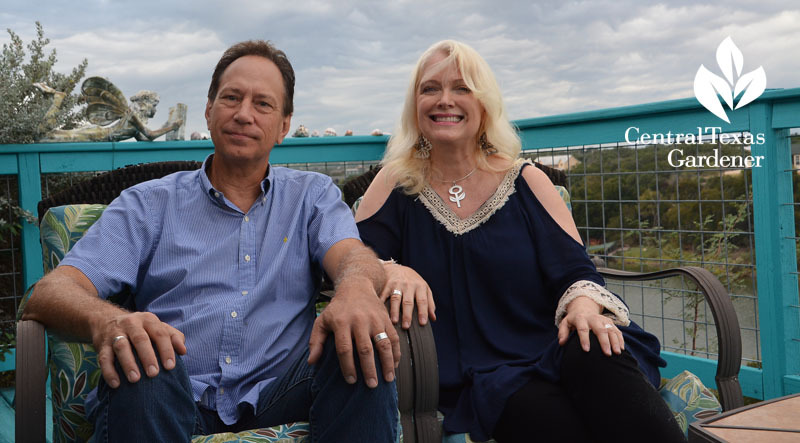 Watch their inspiring story now!